JOSEPH A. 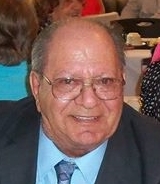 “Joe D.” D’AGOSTINO age 86 of 21 Genesee Street, Mount Morris, New York, died Friday September 9, 2016 at Highland Hospital in Rochester, New York. He was born the son of Salvatore “Sam” and Rose (Scorsone) D'Agostino on May 8, 1930 in Perry, New York. He married Margaret Gracia on May 16, 1958. Prior to his retirement he was employed at Meli Brothers Construction in Rochester for over 23 years and he also was a Bus Driver for Adonnino Brothers in Mount Morris for over 13 years. He was a member of the Active Hose Company of the Mount Morris Fire Department for nearly 50 years and a former member of the Leicester Fire Police. He is survived by 4 Children Kathy (Daniel) Coffey of Mount Morris, Sam (Lisa) D’Agostino of Mount Morris, Joseph (Mary Lou) Williams of Conesus Lake and Michele (John) Palo of Scottsville. 1 step son David (Christine) Augustus of Mount Morris.11 Grandchildren and 18 Great Grandchildren. Sister Margaret Howard of Watertown. Many Nieces, nephews and dear and loving friends. He was predeceased by his wife Margaret in 2011 and daughter Rose Marie Friends may call Wednesday 3-6 pm at the JOHN W. MARTIN FUNERAL HOME, 37 Chapel Street, (Route 408), Mount Morris where a family celebration & Firemen’s service will be held Wednesday at 6 pm. Memorials may be made to the Highland Hospital Hospice. Sign the online registry at www.johnwmartinfuneralhome.com.